Our first business meeting of the year was in the morning, and is always too long, but necessary. A week before the meeting, the location was changed but we were fortunate to find a suitable location. Here are some of the gals working on their blocks. 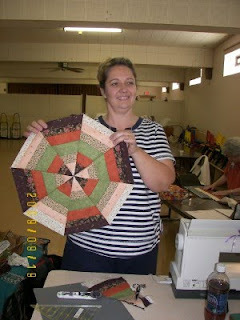 Almost everyone agreed, this block turns out, no matter what colors you use! Finding enough electrical sockets for the Workshop was a challenge but in the end, everyone managed, rearranged, doubled up, and strung extension cords, and naturally, we had a great day! Thanks gals, for a wonderful day. I learned a long time ago about the extra bag. The only thing I don't have in mine is the masking tape. Must put some in there. It looks like every one had fun. I have that bag all packed too. I took it to the last retreat and needed all of it! Love the pictures. My favorite one was the fall colored one. I think it was first. 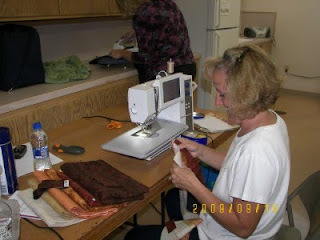 And the lady with all the browns...yummy...those are my favorite colors. I bet it was a great workshop!!! Thanks fo all your help. What good advice!! You did a great job, look how happy everyone is!! Good advice about supplies needed for a class. Keeping organized always makes the class more enjoyable..energy going in the positive direction. 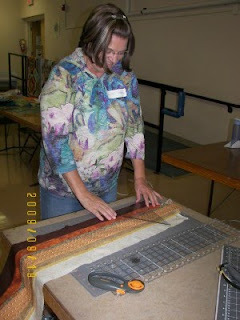 I am so sorry I missed class, but I have confidence that I can still can do the pattern later...and you are just around the corner to help. these....makes me want to do mine. I bought a great DVD instructional on these a while back and have been itching to get to it....Getting together is great fun!!! 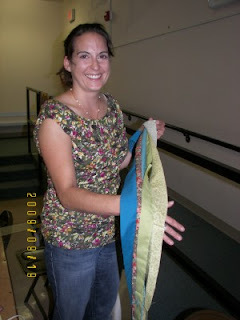 Nice results, both smiles and quilts! I could seriously get side-tracked with this block. Oh boy I surely could. Great pix. Looks like it was a great class. 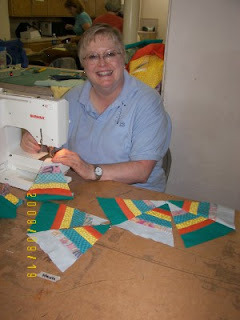 Now you have made me want to pull out my kaleidoscope blocks and start working on them again. 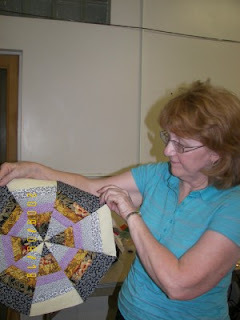 I agree, almost everything goes together in a kaleidoscope block. What great tips for a class!! LOL. I had thought to have some at my home, but alas, did not get the other class mates. I will bet there was MAJOR fun had at your class!! Looks like everyone had fun. I was wondering if you'd be interested in teaching this class in the Central Nebraska.